Dear readers of Belmto. My name is Franzi, I’m from Switzerland and write on the Blog LILLALUND a table and a plate. 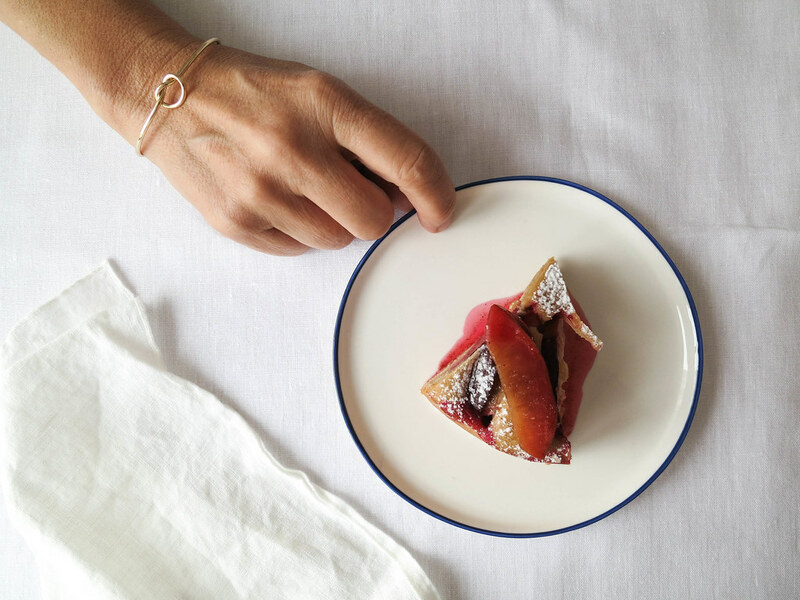 It’s a platform for all my passions: cooking, baking and taking pictures. Ting from Belmto asked me a while ago to write a guest post. Belmto was founded by the self-made designers Ben and Ting. And I‘m truly fascinated by their products. Everything is so timeless, modern and of high quality, exactly the way I like my own clothes and accessories. For my guest post I was allowed to choose a jewelry. Oh boy, that was a tough one. Which one to choose? But in the end I decided for the 'Knot Cuff‘, minimalism meets simplicity. As you might guess, in Switzerland we like cozy and comforting food. For me, food means so much more than just eating. Food is to remember beautiful memories, to take place at a big table with your beloved ones and to enjoy good dishes all together with lots of laughter, interesting conversations and discussions. Now in autumn, I’m especially in love with our wonderful landscape. Fog creeps through the forests, leafs turn golden and I’m able to eat all the good seasonal food, nature has prepared for us: chestnuts, pumpkin, red cabbage, plums, apples, pears and so many others. For that reason I wrote down a special recipe for you. 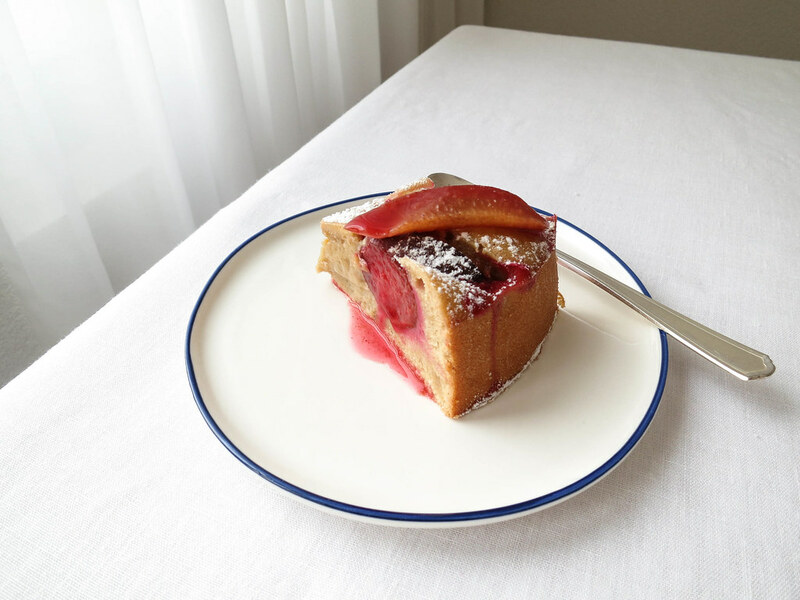 It contains some of my favourite ingredients: orange, cinnamon and plums. It’s a recipe full of autumn flavours and perfect for a cold afternoon, sitting on the couch and reading a good book. 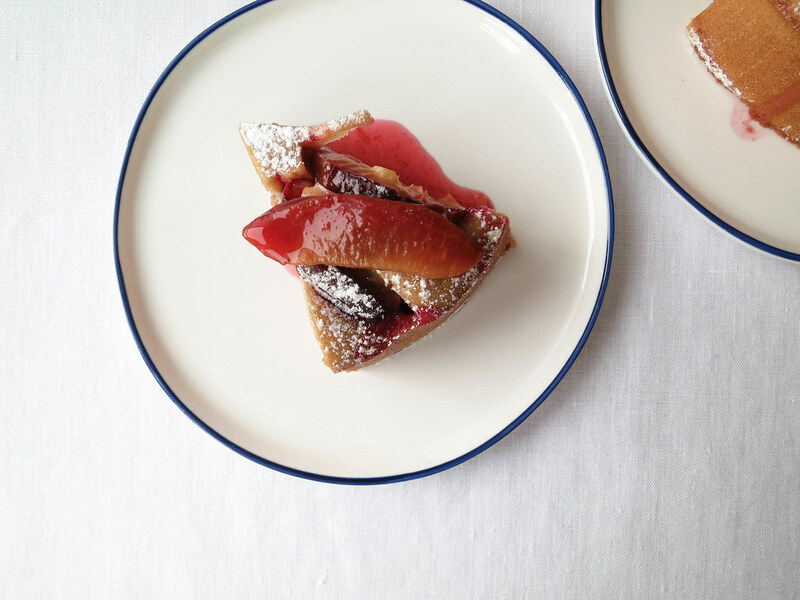 The batter is super moist and I especially like the combination of a cake and warm poached cinnamon plums. Go get the recipe and try it out, I’m sure you will like it as much as I do ! Dear Ting and Ben, I wanted to thank you for the opportunity to write a guest post for your wonderful homepage and to be a tiny part of your work. It contains so many beautiful products and everything is made with so much love and care. All the love and best regards from beautiful Switzerland, Franzi. 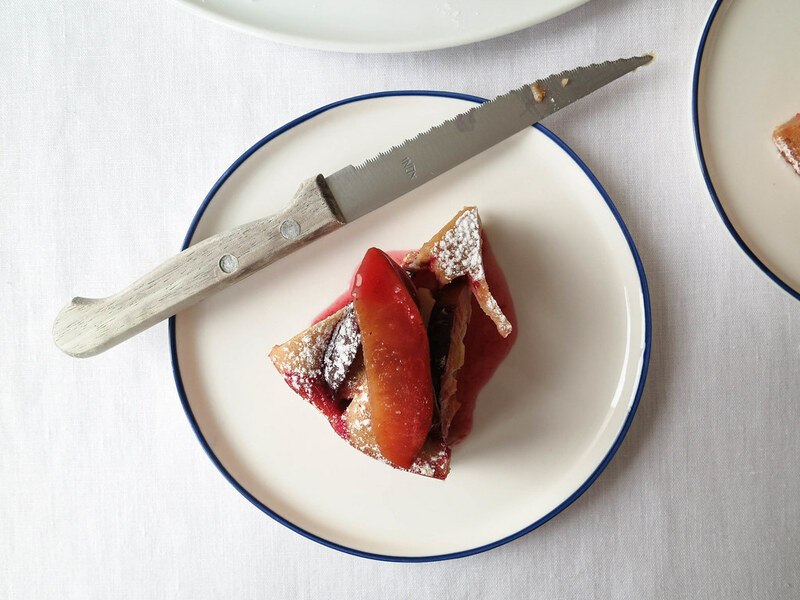 Line a 17cm-springform pan with baking parchment, grease the sides with butter and flour it. Put the springform pan into fridge until use. For the cake beat sugar and olive oil, add the egg and beat until light and fluffy. Add the orange juice and zest, flour, baking powder, salt and cinnamon and beat until you have a homogenous batter. 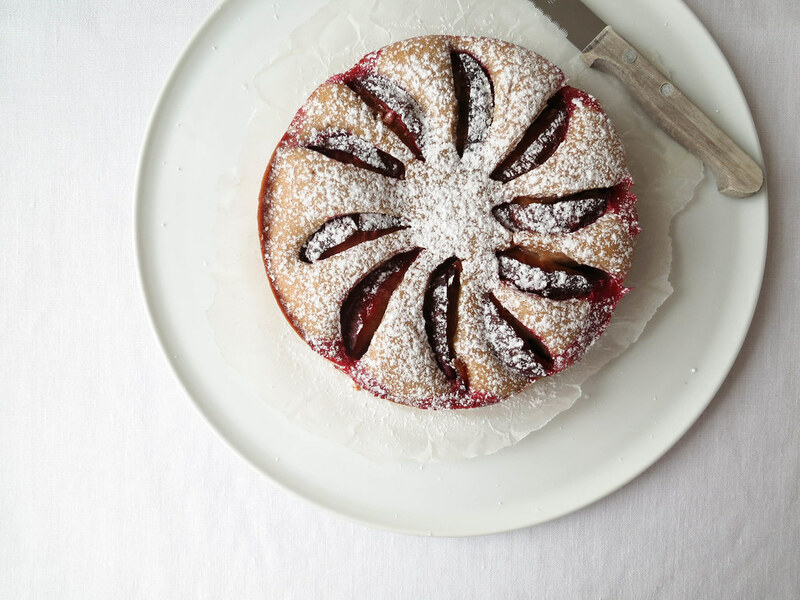 Fill cake batter in springform pan, decorate with the plum halfs and bake for around 55 minutes in preheated oven to 180°C. Let totally cool down, then remove springform pan. 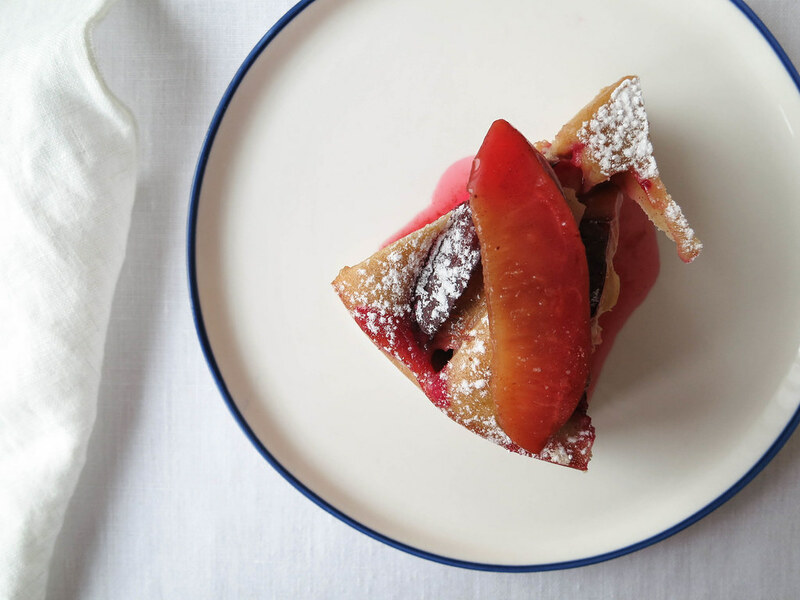 For the poached plums, cook plum eights, water, sugar and cinnamon carefully for around 10 minutes. 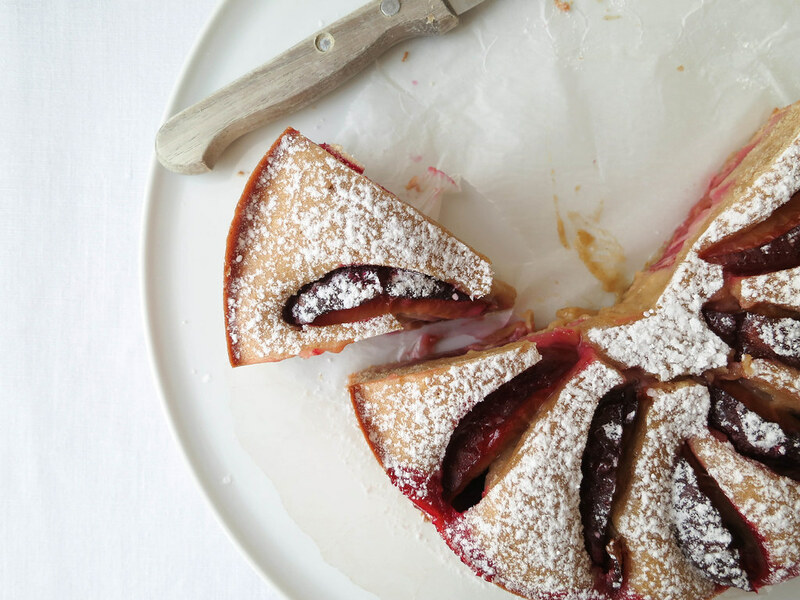 Before start serving, drizzle icing sugar over cake and add the warm plums on top of it.